Max Ferguson is still my favourite CBC (Canadian Broadcasting Corporation) personality of all time. 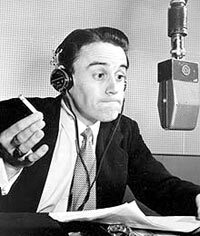 His Rawhide program was breakfast fare for many Canadians at a time when television rendered CBC Radio's ratings so low they were reported as “statistically insignificant”  except during Max's shows. Max arrived at CBH/Halifax from CFPL/London on December 6, 1946, and was soon assigned to host After Breakfast Breakdown, playing Country music, which he loathed. To both hide his identity and force his replacement, he colorfully insulted each song in a voice of an elderly ranch hand named Old Rawhide. His first show generated 3000 positive letters from listeners across the CBC Maritime Network. In 1949, Max moved to Toronto and Rawhide was heard across the country right after the eight o'clock morning News. By this time, there were fifty regulars on the show, all voiced by Max Ferguson, in skits that parodied literary classics, current events and CBC personalities. Old Rawhide still hosted the show even after the music switched to Folk from around the world, making Max a World Music pioneer. In 1962, Rawhide was replaced by The Max Ferguson Show, airing each morning for 25 minutes after the 8:30 News. All of the characters were gone and the program was hosted by Max and his best friend Allan McFee, the original bad boy of the CBC who had been hired shortly after the CBC was created in 1936. I always thought that McFee's antics were fully documented in Max's award-winning autobiography (“And Now...Here's Max”, 1967, reissued 2009) but a recent Edmonton Broadcasters Club talk by Allan's board operator explained what wasn't fit to print in 1967. The show continued, done Live every morning on the AM network until June 25, 1971, as a combination of World Music, a bit of discussion between Max and Allan, and what everyone tuned in for: two daily skits, many of which lampooned the recent activities of Canadian politicians, done in their own voices by Max. Continuing on a weekly basis, as mainly World Music and a bit of discussion, the final program was aired on the CBC FM network on Saturday morning, September 5, 1998. Despite retiring nine years earlier, Allan McFee co-hosted every program until ill health prevented his commute; Allan died December 12, 2000, at age 87. Max passed away on March 7, 2013, at age 89. Debuting here at the time of his death, this exhibit was originally aired on December 7, 1996, 50 years and one day after Max Ferguson joined the CBC. It opens with his signature opening theme, a parody of CBC Radio biographical documentaries, and an excerpt from an early Rawhide program where Max lampoons the pompous CBC commercial announcers of the 1950s.